From in-store displays to reminder signs in the parking lot, we always encourage our customers to bring reusable bags when shopping with us. The use of these environmentally friendly bags has helped us reduce the number of plastic and paper bags sent to landfills by an average of 50 million every month. In addition to carrying groceries and helping reduce paper and plastic bag waste, your reusable bags also have other uses! From practical to fun, here are 12 alternative uses for our reusable bags. 1. Beach and pool totes. Don’t run the risk of getting your favorite backpack wet and sandy. Instead, throw your sunscreen, flip-flops, and sunny day essentials into an easy-to-carry reusable bag. Afterward, you can wash the bag out and have it ready for the next sunny day! 2. Carry school supplies. Reusable bags offer students an inexpensive and effective alternative to backpacks. With many different styles and patterns available, you’ll find one every student will love to take to school. 3. Gym bag. Instead of a duffle bag, toss your bottled water, running shoes, and protein bars into an easy-to-carry reusable bag. A reusable bag is also easier to wash than a duffle bag and can easily fit inside a locker. throw your dirty clothes into a reusable bag. Not only will this be easier to carry than a basket, you can even use multiple bags to separate different types of clothing. Organizing laundry has never been easier! 5. Trick or Treat. The days of using an old pillowcase are over! 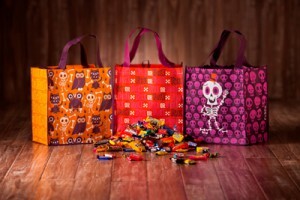 With many Halloween-themed reusable bags available in the fall, these bags are the perfect choice for trick-or-treating. 6. Pack a lunch. A reusable bag can make the perfect lunch bag. Use an insulated reusable bag with cold packs to help keep your items at the appropriate temperature. 7. On-the-go-diaper bags. An inexpensive alternative to diaper bags, reusable bags can hold all the essentials a diaper bag can. 8. Stay organized! From the closet to the kitchen, reusable bags can be a helpful tool to stay organized. You can keep kitchenware sorted, or store those old vintage tees you don’t want to get rid of. Anything can be organized with a reusable bag! With many styles available, you will be able to find the bags that match your décor. 9. For your pets. Rather than get your favorite backpack messy, use a reusable bag to carry all of your pet’s favorite toys and treats wherever you go. You can also use a reusable bag as storage for your pet items. 10. Arts and crafts. Plan a fun weekend activity of decorating your reusable bags. Be as creative as you like, and afterward, you can store all your craft supplies in one of the bags you just decorated. 11. Plant a plant! Reusable bags can be used as the perfect planter! Leave them on a step, a shelf, or on a hook, and fill them with your favorite flowers. Our reusable bags are also perfect as vegetable container gardens; they are deep enough to allow the roots to grow. 12. Gift bags. Reusable bags make excellent gift bags! Stand out even more from traditional gift bags by adding some flair and decoration. The recipient can reuse the bag afterward! Making your extra reusable bags useful in different ways can be a fun and practical way to use your bags when you are not shopping. Do you have another use for your reusable bags that we didn’t list? 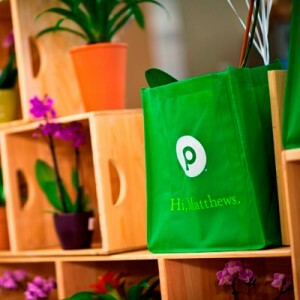 If you would like to learn more about the sustainability efforts and how we create our reusable bags, visit us here.